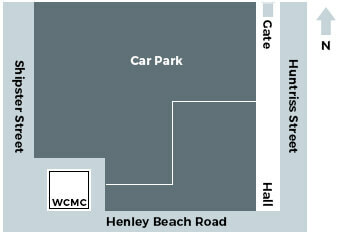 Western Clinic Medical Centre is located at 152/154 Henley Beach Road, Torrensville. For your convenience, free car parking is available behind the building which may be accessed from Huntriss Street, and bus stops are located nearby on Henley Beach Road. Our staff are also able to call taxi services for elderly patients and those in need of transport. Patients enjoy the convenience of the discount chemist, Chemist Warehouse, which is located next door to our clinic at 156 Henley Beach Road, as it allows them to pick up any prescriptions, over-the-counter medications or other health supplies from the same easy location. Email is not for requests for prescriptions, referral letters, appointments, results or other medical information, Please phone the clinic at (08) 8443 9611 for any of these requirements. There will be no response to any of these requests.